Hydraulic press, deep drawing press, die spotting press, trial press, hemming press, etc. Aug 19, 2015 | By CENS | DEES HYDRAULIC INDUSTRIAL CO., LTD. Established in 1976, Dees Hydraulic Industrial Co., Ltd. is an ISO 9001:2008-certified, seasoned developer and maker of a variety of hydraulic press, being a leader-of-the-pack in Taiwan to supply high-grade equipment to many vehicle and parts manufacturers in more than 70 nations. After steady development in the past 35 years, Dees, with accumulated and unmatched experience and know-how, continues to broaden its product lines, having become a major supplier of hydraulic presses that are typically for processing sheet-metal in Taiwan. 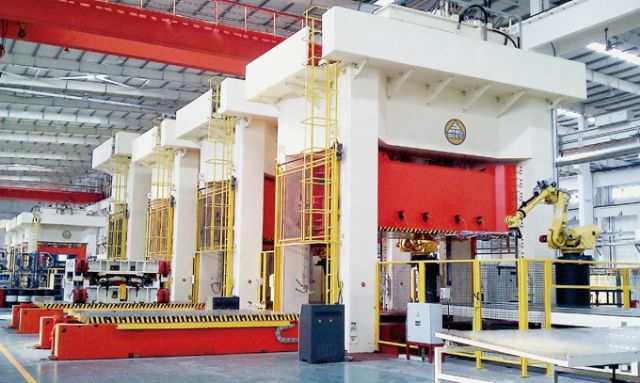 Currently, Dees's available hydraulic equipment includes hydraulic press, hydraulic deep drawing press, die spotting press, trial press, hemming machine, three-way press, chassis-forming press, forging press, etc. The working capacities of the firm's machinery range from 10 to 6,000 tons. Dees says that it has been investing significant resources to upgrade manufacturing flexibility, set up global distribution network, assure quality standards and elevate overall efficiency to win orders for top-end, high-performance equipment, as well as turnkey robotic integration.